Margin: 7.8%. It was 10% before the 2018 redistribution. 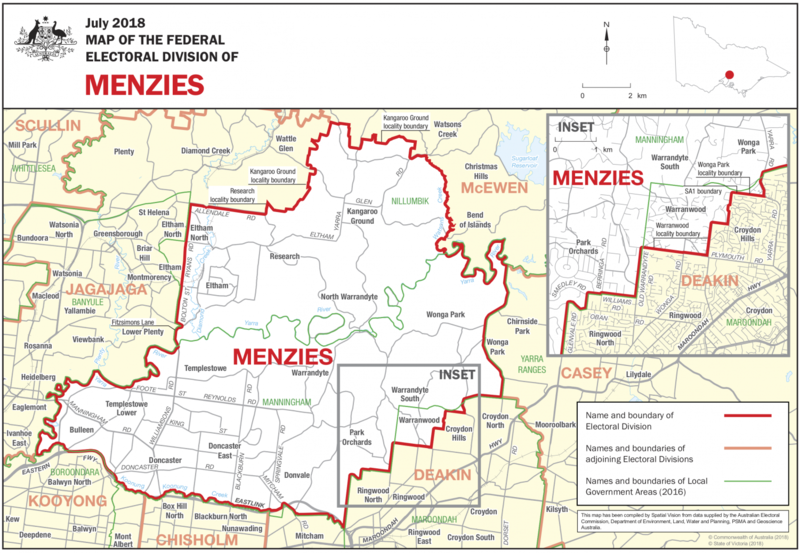 The seat of Menzies was rezoned in 2018 to include the suburbs of North Warrandyte, research, Eltham and Kangaroo Ground, coming from the Jagajaga electorate. 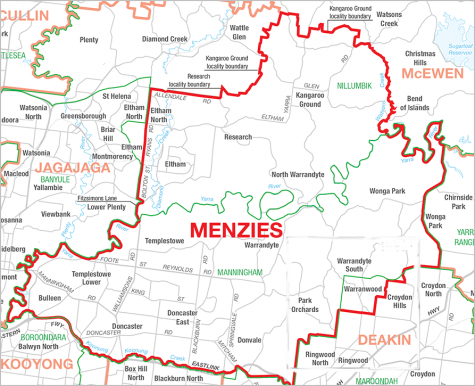 These suburbs joined Doncaster, Templestowe, Lower Plenty, Bulleen, Donvale, Park Orchards and Warranwood in the Menzies electorate. With 21,000 new voters entering the electorate, many from the Labor-held electorate of Jagajaga. A majority of the electorate relies on buses for their public transport . Twenty per cent of Menzies electorate are aged over 65 so the Labor-proposed retirement tax is also set to be an issue. Brett Fuller will run in the seat of Menzies in 2019 for the first time as a candidate for Clive Palmer's United Australia Party. Known for his conservative views, Kevin Andrews is the member for the Victorian seat of Menzies which he's held since 1991. These voters in Menzies are not reticent in giving their opinions on federal politics.. and told us what they think will guide the voters in May. Labor’s superannuation dividend tax plan could be one of the deciding factors in who wins the federal seat of Menzies in outer Melbourne. The activist group GetUp is taking on sitting Federal member for Menzies Kevin Andrews in a political campaign aimed at pushing conservatives out of politics.